Alvin Xiong is an Auckland-based (Howick area) multi-disciplinary artist specifying in integrating painting techniques into different medium to achieve a new expression. He holds a Bachelor of Fine Arts in oil painting from Guangzhou Academy of Fine Arts in China; Certificates of Contemporary Art Theory and Contemporary Art History from Whitecliffe College of Arts and Design in Auckland, and he completed his Master of Fine Arts degree at Elam School of Fine Arts at the University of Auckland in New Zealand. Xiong has been the finalist and received several New Zealand art awards, including finalist in ‘Estuary Art Award 10th Anniversary’, Auckland (2016), ‘The Adam Portrait Award and Exhibition, Wellington (2014), and ‘New Zealand Painting and Printmaking Award (2014), Hamilton; Awarded in the Emerging Artist Award at the NZ Art Show, Wellington (2014), the Tertiary Award in The Trust Art and Sculpture Awards, Auckland (2014) and Best Digital Artwork Category in the National Youth Art Awards, Hamilton (2013). His works have been exhibited nationally and internationally, such as solo ‘E=hv (光=人类视觉)’, 5Art Space (2017), China; solo ‘The Feeling Menmoto, Vero Centre (2015), Auckland and solo ‘Cross influential’, Pierre Peeters Gallery (2014), Auckland. His works have been nationally and internationally collected and commissioned in private and public, such as James Wallace Trust, China National Archives of Guangzhou, permanent light installation commissioned by Remuera Business Association for Auckland Art Festival, installation ‘LALALA’ commissioned by University of Auckland for Lantern Festival. Xiong has been collaborated and organised project with TESLA, Steinway & Sons and Industrial Bank in China as well. 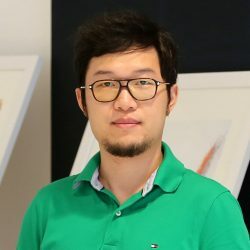 Alvin is also an independent curator mainly focus on curating or co-curating exhibition between New Zealand and China for helping people breaking the language and cultural boundaries in academic or public environment.